Lie on your right side, the left leg lies on top of the right. Your right arm is extended along the floor above your head, palm down. Relax your neck muscles, let your head rest on your right arm. Your body’s lying in one straight line (a). Now slowly lift both your left arm and leg. Keep them both straight (b). 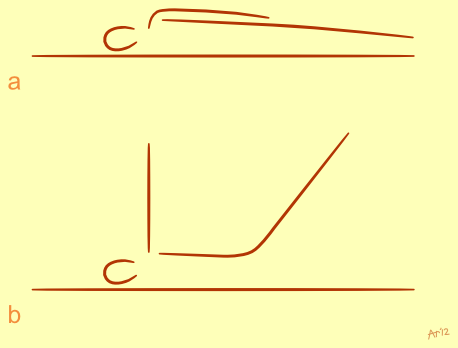 Lower left arm and leg slowly, you’re back in the starting postition (a). Repeat this movement a couple of times, rest for a moment after each repetition. Do the exercise to the other side as well. Substitute “left” for “right” and vice versa in the instructions above. After you’ve done the exercise on each side, roll onto your back and rest for a couple of minutes. This exercise is certainly not about lifting your leg as high as possible. And that’s just fine, as you probably won’t get your leg as high as your arm anyway (unless you cheat of course!). This is exactly what makes this exercise a bit challenging, because you’ve to coordinate this movement so that both arm and leg cover the distance in the same amount of time. Move as slowly as you can, open yourself up to sensations brought about by this exercise. Unlike most yoga exercises, you don’t have to synchronize breath and movement. Breath in a soft and natural way. Apart from training coordination and attention, the circulation of blood and energy is improved as well. 1 Kum Nye is pronounced “koom nyay”. It was introduced in the West by Tarthang Tulku. In the late 1970’s, he wrote a book about it, called “Kum Nye Relaxation” (two volumes). A couple of years ago, this work was republished in a single volume: “Tibetan relaxation: Kum Nye massage and movement” (ISBN 9780007662388). This entry was posted in Uncategorized and tagged coordination skills, kum nye, lying position, mindfulness by admin. Bookmark the permalink.